First of all, I am the founder of Le Nouveau Sommelier. This is a blog created in order to bring wine, beer, spirits and other drinks closer to the people, trying always to create original and professional posts, easy to understand and very fresh. Moreover, I advise gourmet shops (Can Carter in Egham, Barcelona) and I am a sommelier-partner of several wineries in the province of Barcelona (Mas Macia, Bohigas and Kairos among others). A restaurant that always impresses me is Cal Xim, located in Sant Pau d’Ordal (Barcelona) and where the Catalan and seasonal cuisine with wines in perfect harmony immerse you into some interesting sensations. Their specialty is grilled artichokes, a real pleasure. Monvinic in Barcelona ​​is a wine bar that leaves you impressed by their extensive wine, cuisine and high quality service together with their very professional staff. Highly recommended. El Velero in Sitges, a restaurant specialized in Mediterranean cuisine. They offer a new menu every season and the wine list is very balanced. It´s unique and elegant decoration is in keeping with the surroundings. Stands out because of their rice, fish and seafood. Nou Urbisol in Castellolí (Barcelona), where the Catalan cuisine is designed to enjoy real traditional products. Combines excellent menu with faultless service. I do not usually cook at home, but a dish that I improved and I always offer to my guests is “Salt Beef with Dijon mustard sauce and tangerine”. Talking about the perfect wine in combination with it, my selection is “Alges” Clos Pons a red wine from Costers del Segre. Although I live in Barcelona, whenever I have time I love to go to “Tabancos” in Jerez de la Frontera (Cádiz), a kind of Andalusian tavern, and taste their amazing wines, particularly the Amontillado. A very interesting shop in both direct sales and online sales, is Barcelona Vinos. They have a very interesting wine list. “NOA” Mas Macia Cava, excellent for it´s fine and elegant bubbles. His special blend of highly structured Pinot Noir and Xarelo is remarkable. The big French Syria from the Rhone is memorable for me. I still remember the first drink and then come to my mind the tasting notes. One of my latest wine discovery was the Garnacha Blanca by Terra Alta, and specifically the wine Tern in different vintages. 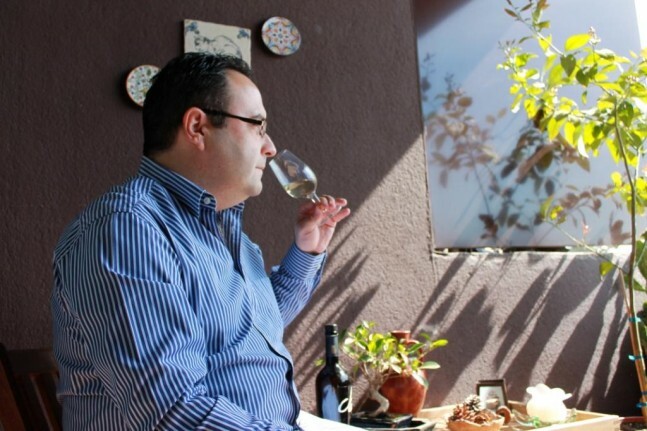 In the DO Terra Alta has initiated a strategic plan to boost the local variety “Garnacha Blanca”. They are very well structured and versatile when pairing complex wines. A wine that I often take is Caliza Dominio Valdepusa, a wine of excellent “vino de pago” at a very affordable price. A very interesting pairing that I have done lately is “fricandó” a typical Catalan dish made ​​of veal and wild mushrooms, with Kairos a very intense garage wine with personality and natural grape variety of Tempranillo. I remember a memorable trip to the DO Ribera Del Duero, particularly Peñafiel, with its majestic castle (also wine museum) from where you can see a vast panorama of vineyards in this area. For most charming you may eat in the sixteenth century brasserie Molino de Palacios a good lamb, of course accompanied by Lagrima Negra from Bodegas Santos Arranz. Any Syrah French Rhone Valley.